Our Sports Editor, Dirk Smith, took the time to sit down with Chris Morgan to chat about his career, involvement with Gay Games, the LGBT Powerlifting Union, opportunities for transgender lifters to participate, the upcoming LGBT Powerlifting Championships, and how more people can get involved in the sport. Dirk Smith- Tell us more about your background in Powerlifting? How / When did you get involved in the sport? Chris Morgan- I first started competing in the Gay Games in Amsterdam in 1998, so effectively I’m a direct product of the Gay Games. I’m one of the few Gay Games athletes to go on to win world championship titles in their sport and claim world records. DS- What are the disciplines of Powerlifting? CM- Powerlifting consists of three disciples Squat, Bench Press and Deadlift. You can compete in either “Full Powerlifting” which is a total created over nine lifts, or “Single Lift”, which is where you can specialise in one of the disciplines individually. There are many age groups and weight classes, which make the sport very accessible for all. DS- What are some of your career highlights? Currently I have 10 World Championship Gold Medals, 5 European Championship Gold Medals and 18 British Championship Gold Medals. Somewhere on route I also accumulated 6 Gay Games Gold Medals. All amazing moments … but I think winning Gold away from home in Moscow in 2010 is my favorite moment to date. I won the overall Best Lifter at the British Deadlift Championship six times consecutively between 2010 – 2015, also winning the Best Lifter at the European Deadlift Championships in Estonia in 2011. In 2015 I was inducted into the LGBT Sports Hall of Fame and in 2018 I received a Lifetime Achievement Award for my service to LGBT Powerlifting. I feel very privileged to still represent Great Britain as both a lifter and official, so hopefully there will still be many more great times ahead. Powerlifting is a wonderful way to meet new friends and visit new countries all over the world. DS- Tell us about your current roles in the sport? CM- I’m still competing and have the European Championships in May (Hungary) and World Championships in October (Slovakia) coming up, where I’ll be lifting in the Masters category. I’ve been an international referee for eleven years and will also be refereeing as part of the official’s team at both of these International Championships. There has been a natural progression in my career and I’m now in the mode of giving back to the sport, I’m the Meet Director of the LGBT International Powerlifting Championships and Co-President of the LGBT Powerlifting Union. My current role is overseeing the development of LGBT Powerlifting globally, alongside my Co-President Charlotte Wareing. DS- You’ve been part of the Federation of the Gay Games movement for a while now. What motivated you to get involved? Tell us more about your work with the Gay Games? CM- The Gay Games are a very important part of my career, as of course it is where I started Powerlifting in 1998. In 2004 the Federation of Gay Games asked me to become one of their Global Ambassadors, which is a huge honor to represent them. I’ll also be assisting Hong Kong 2022 in the delivery of their Powerlifting event, where Powerlifting will return to the Gay Games, for the first time since 2014. I’m very excited that Gay Games will be going to Asia for the first time. DS- Why did you create the LGBT Powerlifting Union? What are your goals for the organisation? CM- The LGBT Powerlifting Union was created after the decision was made for Powerlifting not to be included in Gay Games in Paris last year. 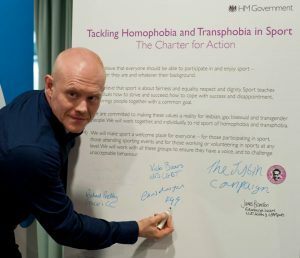 “Gay Powerlifting” has always lacked representation with both the mainstream powerlifting organisations and within the Gay Games movement – we are an advocacy group and not a Powerlifting Federation. LGBT Powerlifting now has an elected representative “Union” of athletes from all corners of the globe, with all three genders, that meet regularly for the benefit of LGBT Powerlifting. I deliberately have mentioned “Gay Powerlifting, because it was definitely our goal to increase diversity by promoting the ideal of LGBT Powerlifting and in particular increasing all Male, Female, Trans, Non-binary and Intersex participation. My Co-president Charlotte Wareing is male to female transgender and is a multiple World Champion and World record holder in the sport. Together we have been successfully assisting mainstream powerlifting federations to introduce their Transgender policies, we are very intent on making LGBT Powerlifting as diverse as possible. DS- Tell us more about the championships in Blackpool, what can athletes expect? How does the competition work? CM- The LGBT International Powerlifting Championships were first held in London 2017 and 2018. For 2019 we needed a new challenge and a new host town. Blackpool is the most LGBT friendly and in particular Trans friendly town in the UK. It is known as cabaret town with it’s many trans friendly venues in the gay village. We have been given an amazing opportunity by Blackpool Sixth form college, with the competition being hosted in their 300 seat high tech auditorium. LGBT IPC 2019 will be the biggest LGBT Powerlifting event ever to take place outside of Gay Games, it’s a really significant moment for LGBT Power Sports. 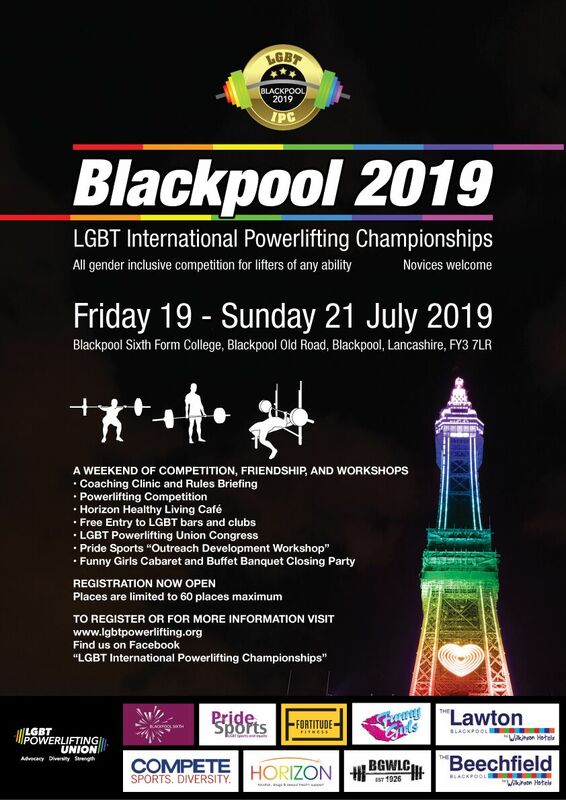 Blackpool is a unique opportunity for LGBT strength athletes to come together and meet people from all over the world. Already we have people attending in 2019 from Australia, Belarussia, Belgium, Germany, Ireland, Romania, The United States and Great Britain. DS- The championships are the first powerlifting competition to include a “third gender” or mixed competitive division. CM- In 2018 The LGBT IPC became the first sports competition in the world to introduce a MX Category welcoming Transgender, Non-Binary and Intersex athletes to participate. We are very proud of our MX Category! This means that from first day a person makes a decision about their transition they have the option to compete as MX in LGBT IPC. Our aim is to provide a safe and welcoming environment for LGBT lifters to develop and find themselves in the sport. DS- You are hosting a series of LGBT friendly lifting workshops, tell us more about those? CM- Yes, we hold regular LGBT Powerlifting workshops for new lifters, which are all hosted by world class lifters, referees and coaches. Powerlifting is definitely a sport where novices need a helping hand, so we have a series of workshops planned throughout 2019 in the UK and will have more coming soon in the USA. 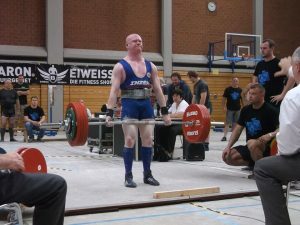 DS- Powerlifting can be an intimidating sport, how can novice lifters get started? What advice do you have for novice lifters? CM- Firstly, the aim for any new lifter has to be to get themselves onto the competition platform, I meet so many people who say they want to do it, or intend to do it, but don’t actually make it to platform. Novices will learn more in their first competition, than in all the training sessions that go before it. Be realistic with your scheduling and the weights you aim to lift, you have you’re whole career ahead of you. Participate and have fun to start with! DS- What advice do you have for Trans lifters in light of recent negative news and media reports? CM- There are lots of friendly places Trans lifters can participate, where they already have trans policies in place for members. In the USA those Federations include USPA, (IPL afflilate) and Revolution Powerlifting Syndicate (GPC affiliate) in the UK GPC-GB is where both Charlotte and myself compete, worldwide GPC are in over 30 nations. 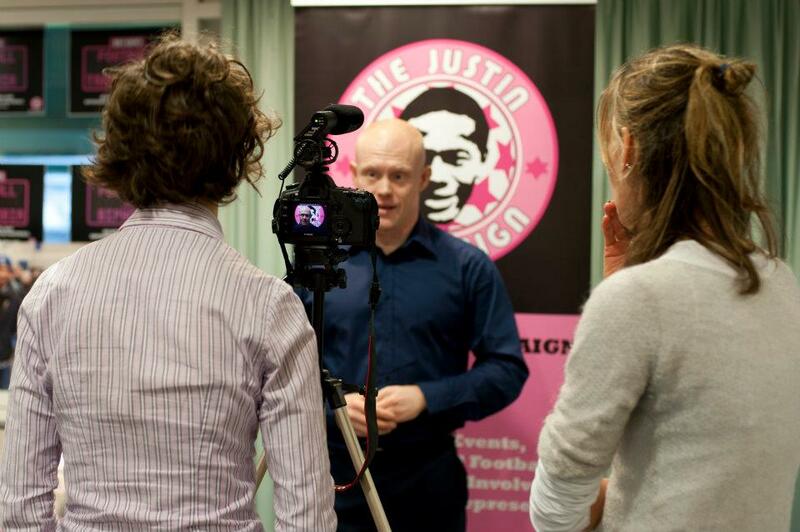 We have worked closely with Global Powerlifting Committee recently to produce their trans policy. GPC are very welcoming towards LGBT athletes and you will already find many existing LGBT lifters in that organisation. They even have a code of conduct relating to social media for athletes and officials, to guard against online abuse. Trans athletes have never had more places they can lift, so things are improving gradually. In the optional MX category at LGBT IPC they can participate in the sport, without fear of any discrimination from day one of making any decision. DS- What are some things we need to know about furthering the inclusion of LGBT powerlifting athletes in main stream competitions? CM- There is still a great deal of work to do in regards to the understanding of LGBT issues within mainstream federations. It is my view that the LGBT community should be leading the way, by inviting interested “stakeholders” into a process of consultation and dialogue to help understanding of trans issues. DS- Is there anything else you’d like to share? LGBT IPC – Blackpool 2019 is happening the weekend of 19th, 20th and 21st July 2019. All are welcome regardless of age, experience, gender, sexuality, health status or ability. Be part of this amazing moment for LGBT Powerlifting as we grow to the next level. CM- We would like to thank Compete Network for becoming one of our media partners for delivering the event, we are very grateful for your support. DS- Thank you for taking the time to chat with us! 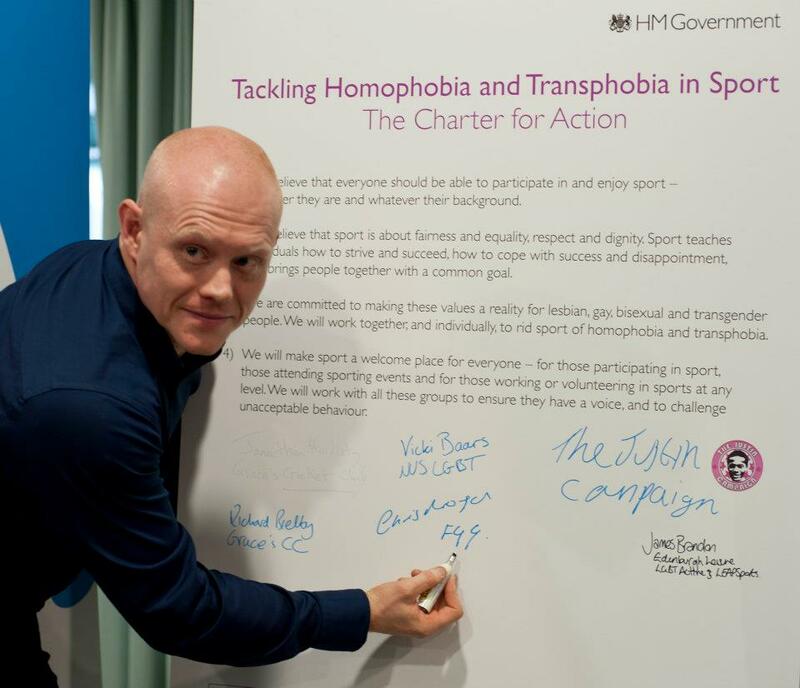 We’re excited to see powerlifting grow for the LGBTI community.